I realized that the world expo was about more than just visiting pavilions when I decided to buy a cone of Turkish ice cream on our first day at the venue. The character serving ice cream was a very animated individual, effortlessly earning the attention of curious bystanders. In fact, the crowd gathered around his booth was so large that in order to even see him you had to find a gap from which to peek. Having made my way to the end of the line, I noticed that the people gathered there were not in fact buying ice cream from this man. Instead, they were excitedly huddled around him and his customers as if waiting for something to happen. Eh, whatever. I handed the woman standing next to him the twenty renminbi for my cone. He scooped a generous blob of the sweet treat onto a crunchy cone and handed it to me. Walking away from the booth with cone in hand, I knew I would never forget this ice cream cone and felt the need to share this experience with the rest of the group. After meeting up with everyone else, I told them how great the ice cream was and encouraged them to get a cone for themselves. Looking back at the expo, it seems that the pavilions that were constructed served merely as containers for the most important exhibit: people. The people pavilion, most commonly identified as the obstacle to overcome in an attempt to reach the other pavilions, was by far the largest and most impacting. Everywhere you looked, there were people. …watching people watching people watching people. Being the pavilion you experience as you attempt to reach the other attractions, it’s hard to imagine going through the expo without it. Moving through the undeniable “mass” of people filling the space between the pavilions, sometimes very dense and sometimes sparse, felt like moving through a bowl of Jell-O: carving out a path that closes up behind you as soon as you pass through, as if you hadn’t been there at all. At the other extreme, there were those people pavilions composed of single individuals, much like the one in which Andrew plays protagonist. More than a few of the members of our group were often pulled aside from the group in order to be photographed, almost like celebrities. The more entertaining aspect of these moments is that once a person mustered up the courage to take the first photo, a mob of onlookers felt the need to pose with the same person, not wanting to be left behind. “Welcome in the Netherlands” reads the sign as we approach the structure. Upon turning the corner to enter the space I see them. I never really associated the Netherlands with sheep, but I guess I don’t know much about this place to begin with. Regardless, they are obviously significant enough to have been included in the design of this pavilion, so just go with it. “Happy Street,” as MVRDV christened their entry into the World Expo, certainly does bring to mind fond memories of the brightly lit carnivals and amusement parks from the good old days. Instinctively, I search for the cotton candy and kettle corn vendor stands, but all I see are sheep. A lot of people, and sheep. Flashing bulbs provide constant visual stimuli, urging you to climb further to see around the next bend. Because this path is open to the outside, your perception of the activities taking place on the ground floor constantly changes as you wind up through the pavilion. At the highest point – looking down from above – the people and sheep on the lowermost level become indiscernible. Shifting my line of sight back to the uppermost levels, I see more people. Or are they sheep? Does it make a difference? In the end we’re all being herded around these pavilions like a mindless flock. Oh hey, that person stopped to look at that thing. Maybe I’ll stop too. Wait, I wanna see what’s there. Hey me too. Outta my way. Let me through. What’s that over there? Unlike the synchronized flocks of birds often seen flying en masse, the patterns of movement within these pavilions are conflicting and chaotic at best. Abrupt stops paired with shoving from every direction pave the way for a lot of collisions. Not that anyone seems to mind. It’s all worth it for that one stamp. Better City, Better Life. For whom? While “preparing for arrival” in Shanghai, My eye was drawn to rows and rows of massive housing blocks. 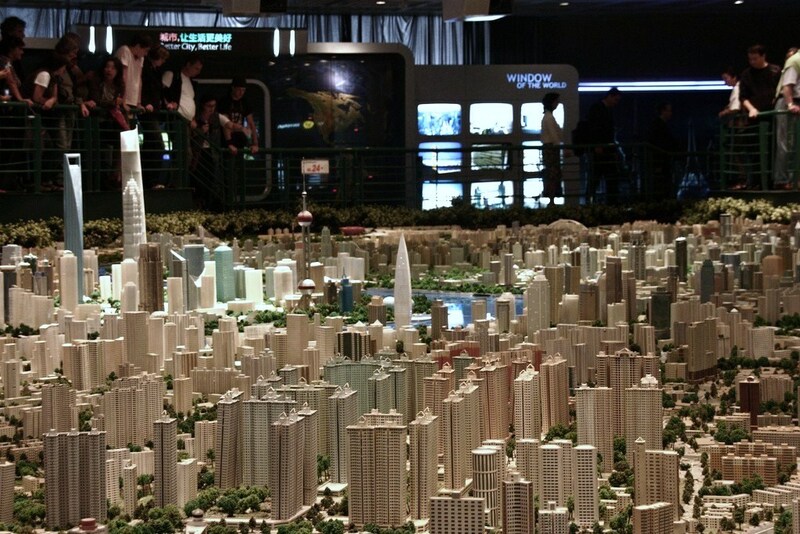 These mega forms give the first glimpse of the rapid urban growth being experienced in China. As the plane landed, an amazing transit system was right there to get you from point A to point B, and even more impressive is the system has only been in place for five years. 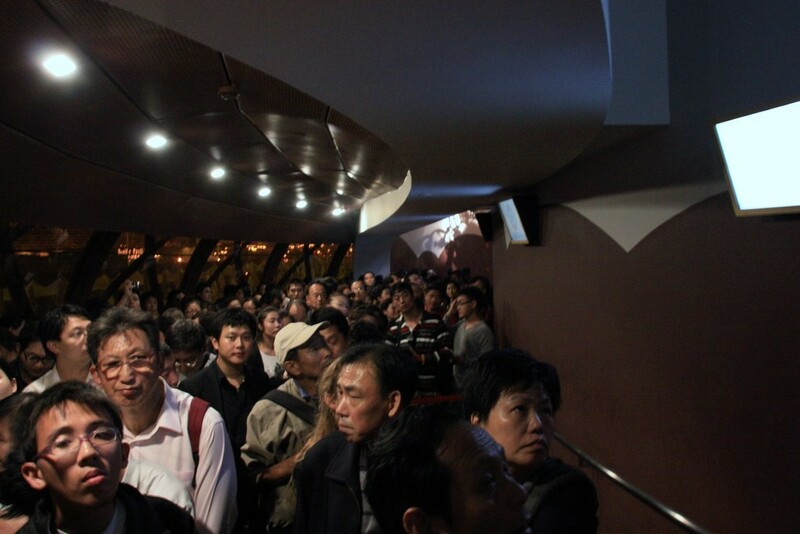 This rapid growth to modernize China has created this new Chinese mentality of perspective. Most of this large-scale development is put into play to demonstrate China’s quantitative power, and to show the western world that it will soon be a new power. With this modernization for power, I question will the people be remembered. In Japan, the level of development has nearly reached the state of perfection, if perfection could be achieved, and Korea is not too far behind. Japan’s success has to do with its culture. There was no trash in the streets and a degree of personal space is amazingly achievable in a dense metropolis. Somehow the Japanese have developed a sense of collectivism that is wired within their way of thinking. This is not saying that the Japanese model is correct, but it begs the question of what type of cultural and urban development is brewing in China. My first reaction to China was even with though it is developing physically there seems to a lack of social development. For instance, standing in the gardens of the Forbidden City, the last stop in what been an extraordinary procession of architecture I felt a sudden grip on my arm. A Chinese woman was pulling me out of our group. My automatic reaction was to step away yet she reached for me again. As I shook my head, saying no to the picture-taking I was becoming accustomed to I could not help but wonder how this breach of personal space was a norm in China. Fast forward a couple of weeks later and we are at the Shanghai World Expo. Here within the pavilions that are boasting modern advancement people are spitting, throwing trash, pushing people, and cutting in line. Something we were taught not to do from the age of three. The difficult part here is to not get into what’s proper and improper, rather stepping back and understanding their culture. As a person who has grown up in the West, I assume my social standards to be the same for the rest of the world. On the contrary being in Japan, and feeling rude and out-of-place, I started to realize how robotic and unnaturally human Japan has become. China has the grit and grime that makes the city feel more real and humanizing. The world Expo was a great example of this real human factor. Although the event is meant to celebrate the development of different countries, the main emphasis on the Expo was the new power of China. Many different countries designed beautiful pavilions and exhibitions, but there is another beauty beyond the architecture. I saw a society that has been closed off for the past 40+ years experiencing something new and exciting. Seeing and experiencing what every country has to offer. As much as that woman pulling me away irked me in retrospect I am beginning to understand the fascination. The theme for the world expo is, “Better City, Better Life” yet one cannot forget a City is not just the built environment but a make up of people, economics, and politics that drive it. I think the challenge for China will be finding a balance between social concerns and economical and political dominance. As they continue to push for a modernization will social issues such as the huge gap between the affluent and the lower class, begin to stunt its growth? I think China will begin to create its own identity, whether it is towards the hyper-density and collectivism of Japan or the sprawled, individuality of the west.